Plummer is a city in Benewah County, Idaho, United States. The population was 1,044 at the 2010 census, up from 990 in 2000. 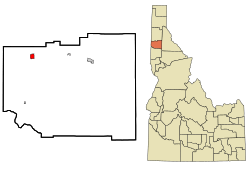 It is the largest city within the Coeur d'Alene Reservation, and is accessed by U.S. Route 95, the state's primary north-south highway. Plummer is located at (47.333423, -116.884393), at an elevation of 2,743 feet (836 m) above sea level. According to the United States Census Bureau, the city has a total area of 1.25 square miles (3.24 km2), all of it land. Plummer has a warm-summer Mediterranean climate (Csb) according to the Köppen climate classification system, although its winter months nearly qualify it as having a dry-summer humid continental climate (Dsb). As of the census of 2010, there were 1,044 people, 374 households, and 261 families residing in the city. The population density was 835.2 inhabitants per square mile (322.5/km2). There were 405 housing units at an average density of 324.0 per square mile (125.1/km2). The racial makeup of the city was 45.7% White, 1.1% African American, 42.7% Native American, 0.1% Pacific Islander, 0.7% from other races, and 9.8% from two or more races. Hispanic or Latino of any race were 8.0% of the population. As of the census of 2000, there were 990 people, 336 households, and 257 families residing in the city. The population density was 875.2 people per square mile (338.3/km²). There were 380 housing units at an average density of 335.9 per square mile (129.8/km²). The racial makeup of the city was 55.86% White, 0.71% African American, 39.29% Native American, 0.10% Asian, 0.10% Pacific Islander, 0.81% from other races, and 3.13% from two or more races. Hispanic or Latino of any race were 2.93% of the population. In the city, the population was spread out with 33.3% under the age of 18, 12.2% from 18 to 24, 26.6% from 25 to 44, 17.6% from 45 to 64, and 10.3% who were 65 years of age or older. The median age was 29 years. For every 100 females there were 96.8 males. For every 100 females age 18 and over, there were 88.6 males. The city's first church was built in 1912. Plummer, Idaho Facts for Kids. Kiddle Encyclopedia.